Located approximately 15 mile drive south from the U.S. border.The city is the second largest in the Tijuana metropolitan area and the most visited beach in Baja California. 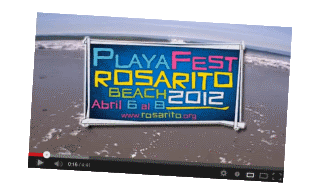 Rosarito Beach Hotel, an Iconic symbol of Rosarito Beach, is a center of actives in Rosarito. The Hotel has shaped the history of the town. The city has always attracted tourist, from the rich and famous to people who want to camp, surf and swim along the beach. Such as the Baja Idol, Mexico Baila, Memorial Day Art Festival, Rosarito Ensenada Bike Ride, Rosarito's Baja Blues Festival Fish and Seafood Festival, International Mariachi and Folklorico Festival, Yearly Rosarito Harley Run, Rosarito's Bike Festival which our hosted by many of the hotels and other venues in Rosarito Beach. Baja cuisine has been feature in many food & wine magazines. It is different as Baja has an abundance of seafood and the cuisine mixes traditional Mexican seasonings and flavors with its own fresh seafood. Numerous restaurants exist in Rosarito, which feature world class Baja cuisine. 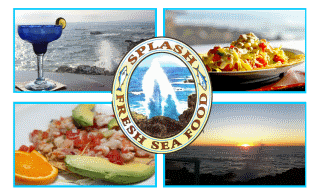 Splash Resturant and Cantina, located at KM 52 Libre Rosarito Ensenada, will also be hosting Sister of Mercy toy drive December 4 2-6pm 2013. They are one of the newer places getting international attention. Security has always been a concern to the rich and famous who want protection from the paparazzi! The city has a department specifically to insure the safety of visitors and to insure nobody is mistreated ... Rosarito Tourist Assistance Department ... The goal of the group is to make visitors trips to Rosarito worth repeating. And the hotels have security specifically for their guests. Its beach and dance clubs are a popular destination for young people during holidays, were the headquarters for MTV's Summer Beach House. and has become a popular spring break location. Surfing is a popular activity in Baja and Rosarito Beach spans several miles and breaks on almost any swell. Down the beach one can find break points such as behind Rene's or farther south to Popotla, behind Fox Baja Studios. Rosarito Beach Hotel often has surfing classes for beginners. Another 10 mile drive south of Rosarito, or if you wish downtown Rosarito, is Puerto Nuevo, well know for their lobster; The five star hotels Las Rocas spa and resort and Baja Grand also partisipate in the events going on in Rosarito and offer specials during busy months. Incorporated Rosarito spans from Tijuana to Ensenada. The Cantamar sand dunes, About a mile past Puerto Nuevo, are a natural and popular attraction for ATV. The location is also very photogenic.